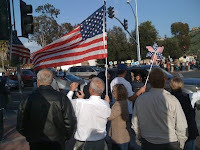 Yesterday, before heading to church, I drove over to Mission Viejo to the corner of La Paz and Marguerite where I knew there would be several hundred people protesting at Mission Viejo's Tax Day Tea Party protest. I thought that this might be a great way to get the gospel message in people's hands in the form of million dollar bill gospel tracts. I passed out 100 gospel tracts in just under 15 minutes. EVERYBODY took a tract who I offered it to. I just said "did you get one of these?" followed by "it's a part of the stimulus package" and people were grinning from ear to ear and asking for more to give to friends. The million dollar question: Will you go to Heaven when you die? Here's a quick test. Have you ever told a lie, stolen anything, or used God's name in vain? Jesus said, "Whoever looks at a woman to lust for her has already committed adultery with her in his heart." Have you looked with lust? Will you be guilty on Judgment Day? If you have done those things, God sees you as a lying, thieving, blasphemous, adulterer at heart. The Bible warns that if you are guilty you will end up in Hell. That's not God's will. He sent His Son to suffer and die on the cross for you. You broke God's Law, but Jesus paid your fine. That means He can legally dismiss your case. He can commute your death sentence: "For God so loved the world that He gave His only begotten Son, that whoever believes in Him should not perish but have everlasting life." Then He rose from the dead and defeated death. Please, repent (turn from sin) today and trust in Jesus alone, and God will grant you the gift of everlasting life. Then read your Bible daily and obey it. Not only do I remember that frozen chunk of tundra... I used to live there! I grew up in Nova Scotia and lived in Ottawa for several years before migrating south. Oh, so THATS why I feel all alone up here! Hope you enjoy the blessings of year round sunshine as you endeavor for the Lord. I'm sure you are enjoying your classes with "The Pusher". Heard you drive 2 hours back and forth once a week to get to them. Must be worth it. I'll be e-mailing you soon, if thats alright. Blessings to you til then. The classes have been a real treat. I hope to host similar classes at my church soon.